People send you emails all day long. Asking you to do something. Guess what? You opened this and I am not going to ask you to do ANYTHING! Well, that’s not exactly true. I’d like you to keep reading. And, I’ll make it brief. Confession. I feel that way about my own story. (What I call my legacy). So, today, I am putting my money where my mouth is and over the next 30 days I’ll be sharing my answers to the Missing Pieces Plan Legacy Questionnaire. You know there’s a motive here, right? Here’s what I think. That by reading my story, my memories, maybe it will help jog yours. It won’t see that hard or time consuming. And, maybe, just maybe, you’ll be motivated to grab a pen and your legacy questionnaire and start writing. 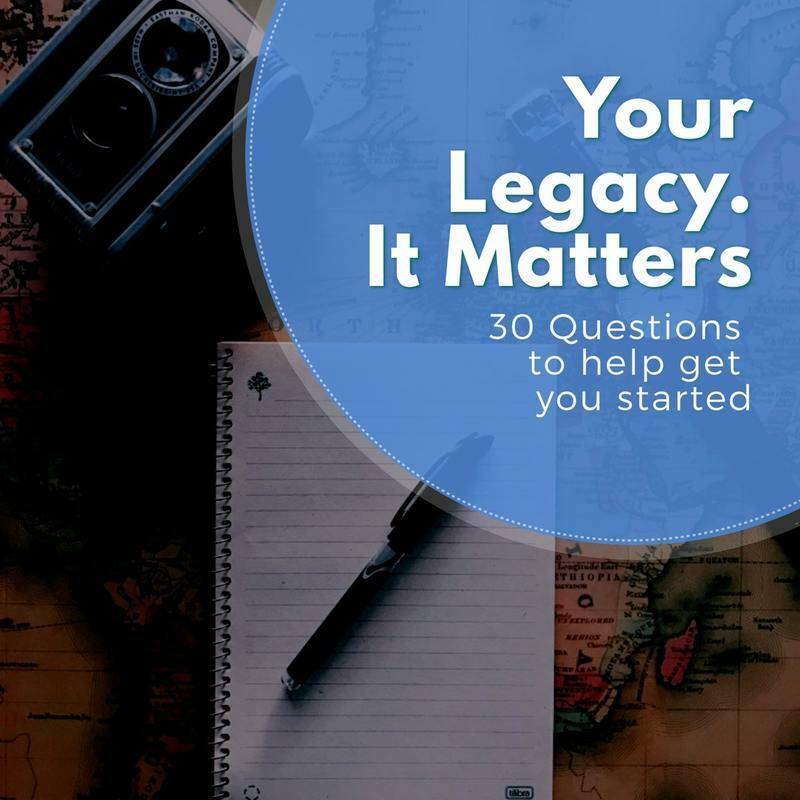 Don’t have your copy of the Legacy Questionnaire yet? Click HERE and we’ll send you one, FREE. Thanksgiving is coming. Around the table, what stories do you want to hear? What stories can you share? Recently I got to spend time with my dear friend, Tori, and her mother. I have been fortunate to witness a few of their family gatherings and celebrations which often took place at the home of Tori’s aunt, Aunt Susie. They included a one-of-a-kind jello salad and a plethora of casserole dishes – any kind that called for crushed potato chips on top. A year ago, I learned of Aunt Susie’s sudden passing and how profoundly she would be missed. It wasn’t until my most recent visit with Tori and her mother that I learned of the ‘misfortunes’ that took place after her death. Aunt Susie lived in a beautiful home that her father, Tori’s grandfather, had built. It was a unique home in style and architecture but made even more exquisite by it’s proximity to the pacific ocean. The home sat on a hill on 5th street…5 blocks from the Pacific Ocean. You could see the stunning view from the front yard. The house was sold after Aunt Susie’s death. I hurt for the family’s loss of this treasure. Selling the house was not what Aunt Susie wanted. It was not her wish. Aunt Susie had been married to her second husband for twenty years. She had one adult son and he had two adult children from a previous marriage. Her husband had predeceased her years earlier. And when she died, the Wills they had drafted while they were married were the most current. However, when her husband was living and presented “estate planning documents” for her to sign, she signed. She trusted her husband knew her wishes for the home and they’d be followed. Yet, as it turns out, what she signed provided that the house proceeds would be divided into thirds. Her son, whom she intended to be the sole heir, now had to split the proceeds of his mother’s home with his two step siblings. He would only receive one-third. If this wasn’t bad enough, Aunt Susie also owned a triplex in the same beach community. Which, you guessed it, also had to be split in thirds. This was not what Aunt Susie intended, wanted or wished. How can you ensure your wishes are followed? Not only is it important to communicate your wishes, it’s also important to make sure they are documented properly. *If you’re ready to get started, start with the FREE Missing Pieces Plan CHECKLIST. Then start documenting your wishes in your Missing Pieces Plan worksheets. BUY YOUR COPY HERE. Every time we take an extended car ride – long enough to be out of the city limits – there’s always something that reminds me of my Papa J, my paternal grandfather. I think of him every time I see “weigh station up ahead” signs along the highway. On our last road trip, seeing these signs hit me in a more tangible way. I think of Papa J every time I see the signs because of a story I was told about him. As we drove this last time, I tried to remember how I heard the story. Who told it to me? Did Papa J tell it to me? Or, did my dad? Sharing a story with me about his father? I decided it had to be the later because in thinking about my Papa J, he wasn’t the “braggadocious” type. It didn’t fit his nature to share such a story. He was mild mannered and kind. So, so kind. I actually don’t remember him saying much. But, I do remember him always looking at me lovingly. He was the kind of grandfather you just wanted to run up and hug. So, my dad must have told me the story. Then, I wandered, do I know any other stories about my paternal grandfather? As we drove, I could not help but wish I knew more about him. The one story I remember, that I think of every time I see a “weigh station” sign goes like this… Papa J was in the home building business and he had truck drivers that would be transporting building materials long distances. Long enough to be on the highway where their load would be weighed. When one driver pulled through the weigh station, to have his load weighed, it far exceeded the weight limits. Apparently, it had rained and the load (I think roofing materials) had soaked up all the rainwater and became exceedingly heavy. I remember the story being told with laughter – that this was a mishap, an unfortunate event. However, I do not remember an ‘ending’ or how this poor truck driver remedied the situation. That’s what I think about every single time I see a “weigh station up ahead” sign. My Papa J and the heavy load. The story is what it is. And, I am grateful to be reminded of him when I am. Yet, what I wouldn’t give to know more. To be reminded of him at other times – not just on road trips. What if I could see him telling me the story? Give the gift of sharing your stories with loved ones. I am living proof they will want to hear them. Whose stories would you love to have on video? Right now, the Missing Pieces Plan is hosting a GIVEAWAY for a family legacy video. It’s valued at over $2,500! And let BOLD LIGHT Productions produce your family’s legacy video!